fatBuzz: What did Edinburgh think of the Pinterest / Instagram breakfast? 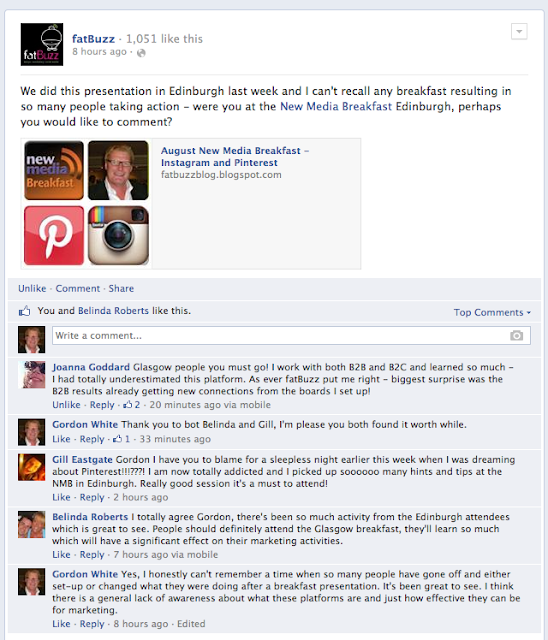 What did Edinburgh think of the Pinterest / Instagram breakfast? We are delighted with the response to the Instagram and Pinterest presentation in Edinburgh last week. So much so that I posted a comment on Facebook earlier today say I couldn't recall a previous breakfast where so many people appear to have taken action and either set up accounts or reviewed what they were already using them for. You can see below the comments from three of the attendees, all of them found it useful. Joanna Goddard has even indicated that she has made new connections via Pinterest...and she operates in the B2B sector, as indeed do Belinda Roberts and Gill Eastgate! Perhaps this is further proof that we now operate in a P2P world. I must admit, it wasn't until I started to put the presentation together that I realised the full potential and power of both platforms. I also realised at that stage that the two platforms, although both image based, are completely different, I could probably even justify a presentation for each. Not only are they sufficiently different, there is so much to talk about with each that they both warrant more time. 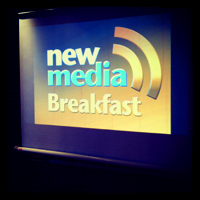 I hope the Glasgow New Media Breakfast attendees get as much from the breakfast on Friday 30th August and, if you haven't booked yet, I would strongly advise you to come along. Please see the original breakfast blog post below for full details.